Big thanks to Secret Food Tours Paris for hosting me with this complimentary tour! I’ve shared my secret (not-so-secret now) life goal of adopting 3 European cities. It felt silly at first, but once I wrote it all down, it felt so true. And Paris, of course, is on that list! To really dive into the city and the culture, I just knew I had to take a food tour in Paris. I don’t just want to adopt the city. I want to walk, talk, eat, and shop like a Parisian. Totally wish I had the fashion sense that would make me fit right in too. Who wouldn’t?! To start the adoption process, I reached out to Secret Food Tours Paris and scheduled a tour in the Montmartre neighborhood–that area right by Sacre Coeur. 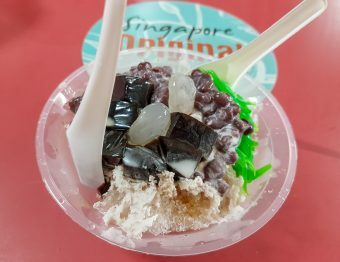 The best thing about food tours is that you never know exactly what you’ll get. But what I did know I was going to get a lesson in how to be Parisian! 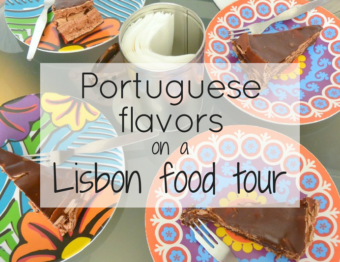 Visitor Tip: Ideally, you should take a food tour when you arrive to a new city. This Montmartre food tour from Secret Food Tours was much different than the tours I’ve taken in Berlin, Barcelona, and London. They were all different companies, but that’s not what I mean. 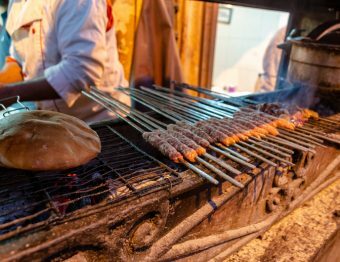 Typically, I’ve been taken to various restaurants to have a bite and learn a little bit about the restaurant and the area, then you walk a few minutes until you get to the next one. I like this “normal” way. The food is well spaced out and we get time to chat amongst ourselves which is always fun since we’re all travelers! Our guide, P.J., was really showing us how to shop like a Parisian! One of the last things we did was to sit in a cafe to relax and inspect all the delicious bites (and drinks) we collected along the way. And then devour them. On the tour itself, we visited a popular cheese shop so P.J. could explain how you can pick out a great cheese for yourself and why the French can’t get enough of certain kinds of cheese. Learning about cheese in this way was really helpful! Our guide made it feel like a class (in the best kind of way) because he gave information that would actually help you. All while we’re drooling over the different varieties and smells. Ohhhh the cheese smells! My stomach started growling at this stop. We hit up a Boulangerie (bakery) for some beautiful and fragrant baguettes. The French take baking bread so seriously that if you call yourself a Boulangerie and you don’t bake the bread on site, you can lose your business! We confirmed it was the real deal when we saw the many ovens churning out various types of bread. There’s really nothing like the smell of freshly baked bread…one of life’s great pleasures. Am I right?! Would it be a food tour in France if we did not go to a wine shop? Nah, not to me at least! Wine is really a funny thing. Regions matter, and specific farms and terra matters. That’s why some wines are so expensive. We were given a lot of great information on how to choose a good wine, but I’m probably going to still ask the people that run the wine shops because I didn’t get THAT good. Going to a butcher isn’t for everyone, I realize that. But fresh meat is amazing in my world. P.J. picked us up lots of things to try…and some weren’t my cup of tea. But I tried them because I’m trying to push my comfort zone a bit. I’m getting so much better with trying foods since I moved to Europe. Maybe already being outside of my comfort zone helps. I don’t know. But I encourage you to try everything too! If I can do, you can too. *pats self on back* I even tried a grasshopper once! Here’s the video…and yes, I am proud of it. Just around the time we were all enjoying the tour but tired of the teasing of all the good food we’ve seen, we hopped into a cafe with a bunch of seats waiting for us with wine glasses at the ready. P.J. wasted no time in supplying us with bread and wine while he, um, cut sliced the cheese up for us. Every time I thought the tasting was over, there was more coming! We tasted so many kinds of cheeses. I was shocked he grabbed so much from the cheese shop. It really felt like we were getting a tasting platter of France. Amazing! The meats went from mild (as in, you may have had it before and nothing “weird”) to me staring at it trying to figure out if I’m actually going to take a bite. That scary piece of meat was head cheese. Click the link to look it up. It’s not something I would normally eat, much less consider trying. I didn’t eat all of it and I still wouldn’t order it for myself, but I’m glad I tried it! I even convinced the woman next to me to try it. She immediately said “no!” when she heard what it was. I’m such a good food influence now apparently 😛 Would you try it? Once all the bites from the shops had been eaten, there was still MORE! We were given crêpes before we left our seats and then went to a chocolate and macaron shop. But I was so stuffed that I kept those little treats for the train ride back to Amsterdam. The food was great, the wine was excellent and the tour guide was super informative. My main critique is that it would have been nice to have more socializing time with the group itself. It was almost so full of information that it was overwhelming! I would often get sucked into what he was saying and not take notes. But I also really love getting to know the others in the group, and there wasn’t too much time for that. It was a PACKED and delicious few hours. What do you think of this format? Have 4-5 stops before you get to taste anything…but then you get to chow down for an hour or so? There are pros and cons to everything, for sure! Oh, I love France! I have lived in the country for 5 months (in the Alsace region), which already learned me a lot about the French food culture. I’ve been to Paris one before, but I never did a food tour! This sounds like a really fun experience and it’s nice that you visit small, local shops. I’d love to try it ones, or maybe in another city :-). 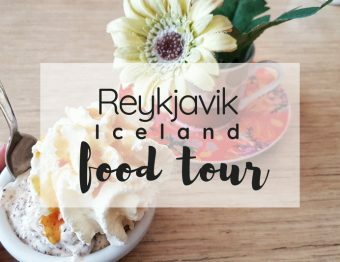 This is really a fantastic way to explore a city and actually shop for ingredients that you get to eat, I would love to do this tour! This sounds like something I would really enjoy. I love cheese, wine, and fresh baked bread, but I love that you went to local shops. I would much rather visit these type of places than big restaurants. Also a huge plus that you get to learn about the food! I love the local, fresh style of Parisian food. It is absolutely the best way to plan your meals! One of the things I often try to figure out when I go to a new city is where the locals go. Be it for food, grocery or hanging out. It always seems to turn out much better than the touristy spots. Marjo recently posted…Is Turkey Bacon Good for You?